Tested to BS 476 PART 22 & 31.1 30 min. An economy priced Fire Proof Letter Box range in various finishes, all fire & smoke rated for 30 minutes. 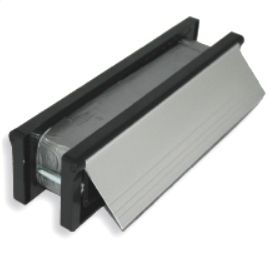 Letterboxes are fitted with an intumescent liner around the telescopic sleeve section of the letterplate. In the event of a fire the intumescent liner expands and seals the letterbox aperture. Fire & Smoke tested to BS 476 with a 30 min. rating. Particularly suitable for applications like post rooms and multiple occupancy residential buildings. With a fully sealed back plate and letter plate flaps there is no need for an integral brush seal. All sizes have a black ABS frame and choice of Satin Anodised Aluminium, Chrome Plated, Stainless Steel, Polished Silver, Polished Gold, Polished Brass. For acoustic rated letterboxes please refer to our Fire and Acoustic Telescopic Letterbox. 306mm x 70mm | 30 minute fire rated letterbox suitable for FD30/FD30S fire doors | Telescopic fitting adjustable to fit doors 40mm - 80mm thickness.